Fz0 / SpringBase = nominal tire deflection (at optimal pressure) ? SpringFactor: does this alter the SpringBase depending on the delta from the optimal pressure ? If yes, how exactly ? Just SpringFactor * delta_pressure ? RadiusRPS: is this related to the variation of the effective rolling radius with respect to the tire rotation speed ? If yes how exactly ? WearRate: out of curiosity, how the wear is calculated ? NumKeys, Key0, Key1: what are these ? dry_grip, wet_grip: do these scale the D coeff (peak value) in Pacejka MF ? resistance_dry, resistance_wet: are these scale factors for q_sy1 ? After closer inspection, the 1st link above seems to refer to a model less complete than the one used by Piboso: coeffs p_Cy2, p_Ey5 and p_Ky6 (al from lateral force at pure slip) are all missing in the link. GP Bikes uses Pacejka 2002 motorcycle magic formula. I think I found what is numkeys for, it's something related to the tyre grip and the wear. 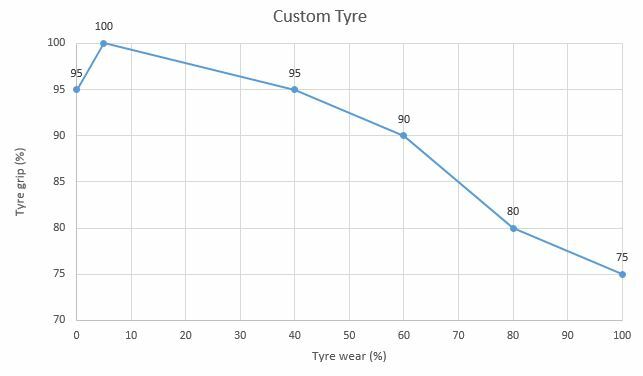 The first value is the tyre wear and second value is the tyre grip percentage for the specific compound. Between Key0 and Key1 the grip value is calculated using a linear interpolation I guess. 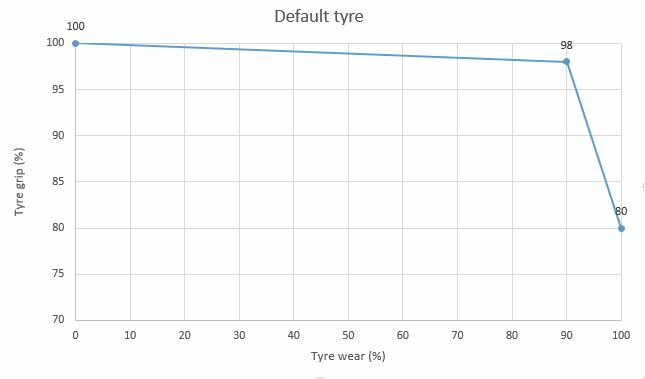 And by default if you don't add a key on 0% wear and 100% wear the values are 1 and 0 on each. Piboso can you confirm this? 1: Is the springbase expessed in N/m? 2: That value is without pressure? 4: how can be the damper calculated? 4: A starting point could be 0.35 * critical damping, where critical damping is 2 * sqrt( wheel_mass * tyre stiffness ). I observed, playing around the radial stiffness, that the bike can handle the kerbs and track ondulation (a bump, i.e.) nicely while the bike is straight. But the problem apears while is turning. Is the Kl (lateral stiffness) simulated? If not, could be possible to add in the future?